I've been wanting to try making brandied cherries for a long time and finally got around to it after picking up some organic Rainier cherries at Costco this year. There are lots of variations of brandied cherries out there. Most recipes use a simple syrup of sugar and water but I decided to use honey instead. Another unique ingredient I chose to use for my brandied cherries is limoncello. I was originally going to use brandy and bourbon but at the last minute decided on limoncello instead of bourbon. I later picked up some lapin cherries and made a batch of bourbon brandied cherries too. You can really use any liquor you want. You can also play around with different spices like cardamom, allspice, juniper, etc. Gently simmer honey, water and spices for 10 minutes, stirring occasionally. Remove spices with slotted spoon. Stir pitted cherries and lemon juice into the pan of syrup and return to a simmer until cherries are heated through. You can simmer longer for softer cherries. Stir in the brandy and limoncello. When heated through (do not boil), remove from heat. Use a wide mouth funnel and ladle into clean, sterile glass jars leaving a 1/2" gap from the top of the jar. Tap the jar on the counter to remove air bubbles. Top with clean, sterile canning rings and lids, screwed on lightly. Allow the jars to cool and seal. Tighten the rings of the jars that sealed properly, you will hear a pop and the lid will be sucked down. After the jars are cooled, there should be no give when you press down on the lid if the jar sealed properly. Sealed jars can be stored out of direct sunlight for up to a year. Unsealed jars should be refrigerated and consumed within 2 weeks. Yields approximately 56 ounces. 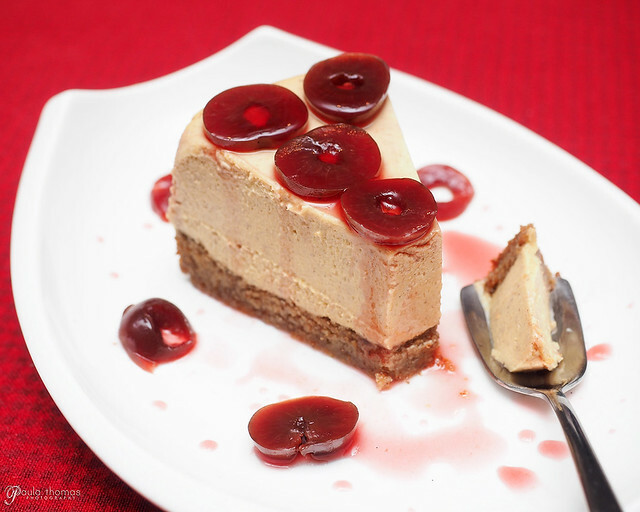 One of the ways I enjoy the brandied cherries is to top off a cheesecake. This place looks familiar perhaps. This dreamy location meets real glam at the hands of the manager. It’s sophistication with a dash of bliss. At our visit to this event venue Atlanta there were several highlights.